There is also now a chart for this pattern. Repeat rounds 15 through 30 until there are 17 stitches between each marker. Wow…Just stunning! taking a lace class now..This is on my list. I love this pattern. I was wondering if I made it from a worsted weight yarn if it would lay flat? I have some lovely pink in my stash but it is worsted weight not dk. Thanks for the beautiful pattern and any help you can give me on my gauge. Use slightly bigger needles, like 8s (5mm) and cast on 12 stitches less than given for the size you want. That should get pretty close to the right size. stiches? Is it each sides will be 87 stiches? Yes. Cast on each of the sets of 87 or 111 etc for the size wanted, and place a marker between the sets which will be the corners. medium size (24.5″ square)Tiffany Lace Baby Blanket? It would take approximately 550 yards (10.5 oz). I am not really an experience knitter, but want to tackle this blanket. Now… don’t laugh at my question: Is the blanket knitted together or in sections? It is knitted together as one piece. No seams. That I like! I just want to knit! especially lace, forget the seams! make all the other sizes besides medium??? On my later patterns I’ve been including a chart for the different sizes with that information. I added one of those charts for the Tiffany pattern at your suggestion. These charts are a superb idea. The first time I saw one I thanked you–in my head. Now I’m thanking you out loud.. I love this pattern and would really like to make it. If I make it in worsted weight yarn any suggestion on how to figure out how to calculate how much yard I should purchase? What size do you want your blanket to be? Also, if you already have a specific yarn picked out, what are it’s needle size suggestion and gauge? The mid-sized blanket takes approximately 550 yards. 7 oz of Baby Soft would be about 640 yards, so one ball should do it. I don’t understand how using a circular needle, with the stitches joined, can become a flat blanket! This is definitely a different method than the usual for making a blanket. The stitches cast on form all the outside edges. The decreases make right angles so that what you knit becomes smaller and smaller until it meets at the center. This blanket is so beautiful! I am also going to attempt it in WW yarn rather than DK. I’ll size up on my needles. Thanks so much for writing and sharing this awesome pattern!!! I love this baby blanket. I’m assuming that the 24 inch blanket is for preemies? That is the size I’m most interested in. I’m anxious to start on one of these for donations to hospitals for the babies too small to survive without the warmth needed to aid them. I know that the various groups that accept preemie blanket donations want different sizes, so I provided directions for several sizes hoping that would meet the need. Thank you so much for knitting for charity. Thank you so much Mama! I’ve down loaded the pattern with all the different sizes. You rock Mama! You have a huge heart to help me with the different sizes! I can hardly wait to start knitting! Chris, my printer is not working either, so what I do is go to our library downtown and use their computers to print out my patterns, or anything else that needs printing. It is ten cents a page, unfortunately, but it is working for me until I get this printer fixed. Happy Knitting! You actually don’t even have to take your laptop. Just upload to a flash drive and FedExOffice will print from that. This is a beautiful blanket. I have just learned how to yo in a blanket I am making now. I have tried to learn to knit in the round and just can’t get the hang of it. Is it possible to knit the small or medium in straight needles? I usually use a 9″ for my baby hats and booties and not the 6″. I am a senior and have trouble with the smaller needles. Thanks for any help. This is how I would convert this to straight needles. Only cast on two sets of the stitches to do two sides at one time. Once those two are completed, you can cast on the other two sets of stitches to make the other two sides and just seam them down the middle (which will be along the diagonal). Since you will be turning your work, make the even numbered rows the right side and the odd numbered rows the wrong side. On the wrong side rows, you will exchange purls for knits and knits for purls. You will also work those rows in reverse order, although they are for the most part the same going from either direction because they are mirrored. I went ahead and converted the pattern for you so that you won’t have to figure it all out. You can just follow this as written for working on straight needles. Mama! WoW! you are an angel! when u say knit across to last so many stitches before marker do u mean each marker or the last marker? Each. Each section is completed four times to make four sides of the blanket. You are probably the most caring, most generous, and most thoughtful knit pattern designer I’ve run across as I scour the ‘net for baby blanket ideas. I, too, knit for the babies who might not otherwise have a cuddly handcrafted blanket and try to make each one unique to make it special for each baby. I’m a wannabe Nana so I think of the babies who receive my blankets as my grands. This blanket is soooo beautiful. Can only knit on 2 needles and I know I would be to stupid to be able to follow those directions. Beautiful Beautiful work.Do you have anyother patterns that would be so nice. I don’t have any lace baby blanket patterns that aren’t in the round like this, yet, but I add new patterns frequently. Check back from time to time. I will be adding some textured baby blanket patterns soon. I like this pattern, however I was concerned with how the opposite side looks. I like baby blankets that do not have a distinct front or back. Do you have any lace ones similar? It is really hard with knit lace to not have a front/back distinction. There are some reversible knit patterns, but usually they are more simple knit/purl patterns. I find more reversible patterns in crochet. There is a print icon at the top of the pattern you can use to print just the pattern. This is so beautiful! Can’t wait to get started. Love having options on sizes. Mama – What about us BIG babies??? This would be just beautiful for our new condo in Myrtle Beach. Can you provide info on the “rate of decrease?” It appears that there there is a one stich difference. The size can be increased by adding any multiple of 24 to each side. On the rounds with decreases, there are 8 decreases – 2 at each corner. Every fourth round is not decreased. Was that what you are asking? I keep getting 16 stitches at the end of 2nd round.i have 179 &each gap is13 stitches.what is wrong?please help. I have counted the sts they r179 which is correct ,I have counted all the stitches ,they r all correct.k2tog k9(k3 yok3sk2pk3yo)repeat()I still have16 sts the end???Help? How many stitches did you initially cast on for each side? What are you referring to as the gap that is 13 stitches? 183 four sides.m wrong about 13 sts they were 11between sk2ps stuck in second round,! So after round one, you would have 181 on each side since there was a decrease on each side of each corner. For this size, the pattern of 12 stitches is repeated 13 times so 156 stitches in the repeat section. Does this help sort out what is happening? DK weight baby yarn is lighter than worsted but just slightly heavier than sport. A couple of popular examples are Bernat Softee Baby and Lion Brand BabySoft. Do you cast on four different sections separately on the circular needles? I don’t know how else you would be able to gauge the amount of yarn needed. This looks like a beautiful blanket. It’s one continuous cast on with just markers to separate the four sections. I assume the yarn needed you are talking about is the yarn for the tail of the long tail cast on. With casting on that much, you definately don’t want to underestimate and come out short. I usually estimate at 3 times finished length, which in this case is all four sides of the blanket. I have also heard of estimating by allowing an inch per stitch. I love this blanket. I have started it for a new grandbaby that is coming in August. I used a knitted cast on. Hope that is o.k. That way I didn’t waste any yarn and was sure to have enough for the cast on. Can’t wait to see the finished blanket! I am on the second part of round 28 and now the knitting is horribly twisted and I can’t get it untwisted on the circular needle. Do you have any suggestions? Thanks for any help you can give me! Oh no! I hope that doesn’t mean that the original join was twisted but that is what it sounds like. I don’t know of any cure for that. On a bottom up poncho I made one time I realized it was twisted after a few rows and chose to leave it in, made a twist and knitted over it so that there was alway a little twist in the bottom border, but after 28 rows, I don’t think you’d want to leave a twist in there like that. I’m so sorry. I don’t know of a solution other than starting over. I would just caution everyone reading this to be very very careful with that join. I usually check a few times around when making the join and after the first couple of rows to make sure I don’t have a twist after my poncho experience. Elizabeth Zimmermann suggests cutting and joining (rather like a steek) but she’s a braver woman than I! Ouch! I did a Moebius scarf and wound up with an extra twist … my friend liked it that way so I sent it to her, error and all. However, the next time I wanted a Moebius, I knit a straight scarf and then sewed together the two ends in Moebius style. Who would know! But you’re going to have to frog — no way out of that, Linda. Frogging gives me opportunities to learn. I just knitted an infinity scarf and after about 20 rnds, my work, it seemed, just magically got really twisted. It was pretty twisted up and my only fix was to pull it all out. But I gave it one more shot and went really slow. I started at one end and turned it around straight all the way to the last marker. BINGO. I think sometimes if your circular isn’t quite long enough the fabric just acts funny and twists itself, and it looks terrible and unforgiving. I always give it one last try before ripping it out. This pattern is amazing because I just learned to mitre corners yesterday! I was a little thrown by how many stitches are in the cast on though. I like to read the comments and questions of others to figure out what I don’t understand. Thank you Jesus for the internet! While I read and pondered on that said number it came to me that you’re starting on the outside and working your way to the middle by using decreases instead of from the middle out using increases. Thus the center is at the bottom. I was like “What???? ?” Thanks for sharing this pattern. I’m definetly going to try it. Thank you for this pattern – I am going to try it for sure – I get tired of starting at the center with very few stitches, and then having to go until 1 round takes forever. Starting at the outside and going in will make the blanket SEEM like it is going faster. I have only knitted a couple of things, but am an avid crocheter. Do you know of anything similar that i would be able to crochet? It is a beautiful pattern. It is a beautiful pattern. I am a little confused as to how to start.How many stitches do I cast on? What does cast on in 4sets mean? If I am doing medium, do I cast on 135 times 4 leaving a marker after each 135th stitch? Please help me understand as I want to knit this Blanket for my granddaughter due in September. You have it absolutely correct. There are 135 stitches for each side. You cast on all four sides with the stitch markers between to mark the corners. i love this! do u have this charted? i am not fond of all the written out directions, gives me a migraine! I don’t currently have it charted, but I think I can do that pretty quickly. If I can do that in the next couple of days, I will post it and let you know. I prefer not to use the magic loop method. Rather I’ll just switch needles with smaller cable lengths as I’ve got a range of them in size 6. Which cable length would you start with for the various finished sizes. This pattern is so beautiful I just have to make it! Start with the biggest you have for any of the sizes. Even the smallest size, you are beginning with 60″ of stitches. I did what you are going to do and just switched small circumference needles as long as I could. I only used the magic loop for the very center. Going to start today! Does it require any special blocking needs? Really just depends on the yarn. I made mine in a polished cotton and didn’t block it at all. I have just finished the blanket and am very pleased with it – thank you so much for the pattern. I used a circular needle for the first time but when I got to the very middle I struggled to make the stitches. I was dividing the stitches in half, knitting one section then pushing the stitches round and knitting the second section but when I only had about 10 stitches left between markers I couldn’t manouevre the needles and had to change to double pointed needles. Is it possible to knit the whole blanket on the circular needle? Ha! Ha!I figured it out thanks. And also realised I’d knitted the whole blanket with my needles back to front! Never mind. It still looks great and I’ll know next time. Beautiful, looks do able, would be a lovely gift. My first grandchild will be draped in this afghan coming home and at christening!!! Thank You it is just beautiful. 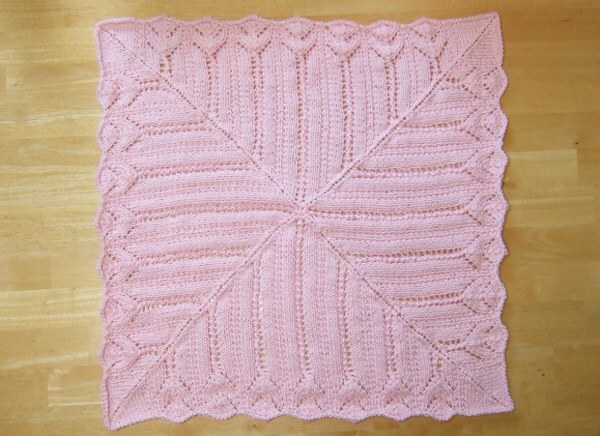 I love the lacy baby blanket. I would like to try and make it. However I am a beginner at knitting. I can do the simple knit and purl but that is about as far as it goes. If I can watch someone make something I can follow the directions. I do not know how to read a pattern and follow it. Do you have an online tutorial for this lovely blanket? If not do you have an easy tutorial for learning to make socks? I crochet but still have difficulty with the heel and the toes in the socks. Thank you for your help. This blanket is advanced and not a good project to attempt without some knitting experience. I don’t have a tutorial for it because it would frankly be an hour long. Here is one site with a series of sock tutorial videos. There are many others and lots of different methods of making socks. You can use a search site like Google to find many different kinds of sock tutorials. This is a great webpage! You have answered and explained so many of my years of frustrated knitting questions. Thank you. Hi I love this blanket and am planning to knit it in DK 4 ply…..I see many people went from DK 8ply to WW. What would my yardage requirement be if I went to a DK 4 ply in the 28 or 32″ size? I will try to make an educated guess. What is the gauge given on the yarn? What size needles does the yarn recommend and what size will you be using? I made the hat to match, now working on the big size ….third time starting out!! Any tips on how to not get the thing twisted?? THANKS!! Not really other than to triple check it before you go too far. That is the worst thing about going from the outside in. Thank You, Heather for sharing your patt. Many many ‘KP’ers have been complimenting this patt in the past few days. I note that it’s posted on Ravelry too. You are indeed a talented designer and we are indebted to creators like you! I too will be starting one now that I’ve seen it. I made this blanket last year. After a few false starts, (twisted join in the round) I prevailed! This pattern is thoroughly enjoyable to knit. It’s the only baby blanket I’ve done that hasn’t bored me to death! I love this pattern and am casting on for another one today. Very beautiful baby blanket!!! I was thinking it could also be a excellent pattern for a dish cloth if possible. You could absolutely make this as a dishcloth. For a 10 inch square dishcloth, cast on 4 sets of 63. Thanks for a fantastic idea – My daughter is a surrogate mom – so far she has had 3 babies (all girls) for couples who are otherwise unable to have their own. With each pregnancy I knit a blanket for the baby to go home in with the last one going home two days ago. I also donate blanket and hat sets to the hospital where she delivers. This is such a unique pattern that I think I will be delivering another blanket to the hospital without a delivery pending. I have some wonderful soft gray yarn that I found at a garage sale. It’s been in my stash for 4 or 5 years waiting for the perfect use. My good friend is having a baby in a few months and is doing the nursery in gray (with pink or blue, as needed) accents. She and her husband have been trying for years to have a child. Doctors were not hopeful. After a loss 2 years ago, she is expecting in the spring with her miracle child. This baby needs something SPECIAL! I have the yarn and I thank YOU for providing the perfect pattern to use it with. Susan will LOVE it! I am having problems getting the PDF file to work. The same with the printer function. I was able to cut and paste the text however I would like to save all the info,text and pictures. Any idea why the pdf function isn’t working? I’ll e-mail you a PDF I created with that function. Let me know if there are other patterns for which you want PDFs. If you don’t mind telling me what it was doing, maybe I can figure out the problem. The finished blanket is unique and beautiful. And I must congratulate you on your inclusion of the yarn requirements. The charitable group I knit for often work with donated yarn. This way I can calculate if there is enough yarn to finish the project. Many thanks – it is on my next to do list. Could this be made larger? I would like it about 48inches. I am an experienced knitter but must follow a pattern. I really love this shawl. I am a senior. With the DK yarn and size 6 needles, it would take a cast on of 279 for each of the four sides. Beautiful pattern!!! Is it possible to make some adjustments to make this a rectangle shape? I’d love to knit placemats in this pattern. I love that it’s knit from the outside in, no casting off!!! You can make modifications to make it a rectangle. For the two longer sides, cast on more stitches in multiples of 12. However many extra you cast on will be how much longer those sides will be than the short side. To finish in the middle, you will have a line instead of a single point. I would recommend sewing it instead of casting off which would make a ridge. You could sew the loops together so that they looked like a continuous knitted piece. My general rule of thumb is with a pattern that gives both yards and grams and yarn that gives both as well, to match up the yard requirements. I think those are more true to your needs than grams since yarns vary so much in weight. So I agree that you need 4200 yards, so get however many skeins you need to have at least that. Thank you for the 2-needle instructions! What will the finished piece look like when done with two needles? My visualization skills are not very good. Your creativity is such an amazing gift and that you share so much of yourself with strangers is awesome. When making it on straight needles, you will only cast on half the stitches and make half of the blanket. Then you will cast on again and make the other half. The finished halves will be triangles. When the triangles are joined on their longest sides, they will form the square blanket. I love this pattern I’m planning making few blanket for my son after making my niece. Thanks to my grandma for getting me started on crafting she taught me simple crochet planket and I challenge myself on different patten on YouTube and taught myself how to knit on YouTube as wrll . ever since than I cannot stop making blankets, hats, scarves and even hair assosaries for friends and family. Thank you again grandma Jean Oldenburg. Since you have cast on the same as what is called for in the pattern with a smaller gauge yarn and smaller needles, your poncho will be smaller. If you don’t increase to the size you will need roughly the same yardage as what is called for in the pattern since you will have the same number of stitches in a similar gauge. It will take a bit fewer yards, but it’s hard to calculate an exact amount. This is simply stunning! I’ve looked for and even developed my own pattern for a baby boy that will be a keepsake for mommy. This is absolutely perfect. Thank your for the gift of your ingenuity and talent. This is absolutely beautiful and b I nspiring. I’ve looked for patterns, and even made my own, but nothing inspired me-until your pattern. It is lovely! Thanks for you ingenuity and talent. Hi Mama, this pattern is so amazing I really would like to make it for a friend who’s expecting in June/July! I’m wondering about the amount of stitches involved in the round. I have a 140cm interchangeable cable (60+80 with the joiner) and I’m wondering if I could do a medium blanket with this (so i think it’s 135×4)? Also, is the medium blanket a good size for a cot or is it more of a pram/outdoor/car seat sort of blanket? Thanks! You can definitely do the medium on your 140cm interchangeable cable. I would say it is more the pram/car seat size. Can I knit this pattern with straight needles? You will have to knit this in two parts to knit it on straight needles. Instead of 4 sets of the cast on edge amount, cast on two sets. All odd numbered rows will need to be worked in the opposite stitch – change knits to purls and purls to knits. Make two of these and they will each be triangles. You will need to seem them together along their long edges to make a square. I’ve been wondering if I could make this into a twin comforter. Yes, I realize it wouldn’t be square. That’s where I need help to convert it. What dimensions? This can be made rectangular with slight modification. Love this blanket and I can’t wait to try it! This is my first knitting project so please pardon if this is a knitting 101 question: Will I need to adjust anything if I used The Lion Brand Baby Soft DK #3 yarn? I ask because for the medium listed here there should be 10 oz / 540 yds of yarn (54 yds per oz) used, but The Lion Brand is 5 oz 560 yds (92 yds per oz) so that’s means my yarn is almost half as heavy per yd. Does that make a difference in the size? In the pattern? Any pointers in the right direction is helpful. Thank you! Yardage is more accurate. This will work perfectly with that yarn. The weight difference is because I used cotton which is a lot heavier than acrylic. Another beginner question for which I can’t find the answer; With magic loop, how do you keep the stiches straight with so many initially casted on so that you don’t have unintentional YO’s and/or ladders in your work? Keeping the cast on straight is a big challenge. I usually check it several times before I join to the beginning. To keep from making ladders at the loops of the magic loop, just pull a little (or even a lot) tighter on the first stitch of each stretch. K2tog, ssk, yo, k3, (k6, yo, sk2p, yo, k3), k6, yo, ssk, ssk. So I thought I should repeat the part in brackets 4 times, giving me a total of 56 stitches. So then I have 66 stitches including the last 10 before the marker. But then I have 11 stitches to knit before the brackets start, and I’m not sure how k2tog, ssk, yo, k3 is 11 stitches? I’d appreciate any help on this! k2tog uses 2 stitches, ssk uses 2 stitches, yo uses no stitches and k3 uses 3 stitches – so the first portion uses 7 stitches. k6 uses 6 stitches, yo uses no stitches, sk2p uses 3 stitches, yo uses no stitches and k3 uses 3 stitches – so the repeated portion uses 12 stitches. With the first 7 stitches and 5 repeats of the 12 stitches in the repeat should put you at 67 stitches use to that point. It looks like you are using 14 stitches in your repeated section. Ah, that makes sense. Thank you for your help! This is a gorgeous blanket. I knit on size 6 needles with baby yarn for my 1st grandbaby and it took me so long. Would like to do this on larger needles, but can you tell me if it would 1. look the same? 2. how long would it take ma as beginner to finish blanket (average time)? If you used larger needles with baby yarn it would be really loose and gauzy looking. You could use larger needles and heavier yarn and it would be thicker but not gauzy. Even though I’m an experienced knitter, I’m a very slow knitter. I made a very small version of this blanket and it took me weeks. I am rather curious why you chose to knit such a large project from the outside in. Usually large lace projects start from the center and work out. I learned of your pattern when someone on Knitting Paradise was having to make multiple starts because of a twist in the caston. Someone else described it as the blanket from hell. I made this first as a hat knit from the bottom up, so rather than rewrite the direction, which would look different, I made it from the outside in. It is definitely a novelty type of design, and can be a real pain to start, but I have seen several photos of them completed and the end results make it worth it. OMG I rippped this out four times after getting up to 40 rows until I finally figured out what I was doing wrong. Now I’m almost finished with it and it’s turning out beautifully. Thank you! Just to say after starting three times am now up to round 27. Kept getting twists. So I cast on with the thumb method and knitted two Rows garter stitch without trying to join into a circle. Now the best part. DO NOT LET GO OF THE NEEDLES And join Into a circle and continue with round one. This worked for me and saved a lot of hassle and you just have stitch a little bit where you joined it. Hope this helps others. Mary C.
That’s probably going to be about 4 stitches to an inch so 60 stitches all around. mama is all #4 yarn worsted ??? Afghan and Aran are also included in #4 and are just a tad heavier than worsted. Do you want to just have the diamonds with the seed stitch edgings or do you want to alternate the diamonds and pineapples like it is given in the pattern? Estimating yarn needed is not an exact science, but my best estimate is 18 skeins. I estimate 16 skeins. It’s not an exact science for me to give you a method to always make those calculations. I find similar blankets I’ve made and proportionalize the size of mine to the size you want.